"Some stories shared by parents and children have the power to be remembered long after the loved and repeated tellings or playings are over. THIS JAZZ MAN delights on several levels. The jazzy, snazzy illustrations of the legendary musicians-Louis Armstrong, Duke Ellington, Charlie Parker, and six others-evoke each personality and his music. The images will capture young readers while the easy rhythm and familiar counting song based on "This Old Man" will begin their jazz education. The bonus for parents, or older young listeners, is the epilogue of biographies of each musician, complete with highlights of their fame, including names of songs. The music-drums, piano, sax, trumpet, and bass-is as much the star here as Williams's narrative. Live Oak has added another winner to their Jazz series." 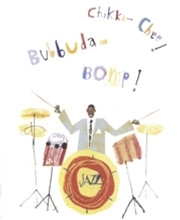 STARRED REVIEW"This marvelous read-along re-creates Ehrhardt's 2006 rhythmic picture-book text (a clever take on the traditional counting chant "This Old Man"), a joyous introduction to nine African American jazz musicians. Youngsters are transported to historic jazz clubs through stage-setting audience applause and original music melding the beat of the traditional children's song (best known for lyrics "knick-knack patty whack") with riffs honoring the melodic style and trademark tunes of featured jazz masters Louis Armstrong, Charles Mingus, Charley Parker, Bill "Bojangles" Robinson, and five others. Narrator Williams speaks, scats, and sings the text, re-creating the mood and tonal quality of each jazz legend. ...This highly recommended production-interweaving picture-book storytelling, jazz history, dynamic vocalizations, and a smoking jazz combo-elevates and extends the print version. Pair this with Live Oak's read-along production of Walter Dean Myers' Jazz (narrated by James "D-Train" Williams and Vaneese Thomas), the 2008 Odyssey Award winner for excellence in audio production. " "Karen Ehrhardt's lively retelling (Harcourt 2006) of the traditional song, "This Old Man," introduces nine African American Jazz greats, including Louis Armstrong, Charles Mingus and Charlie Parker. For example, "This jazz man, he plays four/He conducts 'em through the score," is conductor Duke Ellington. The musicians are identified by name in the back matter, where Ehrhardt provides biographical information about each one. The book perfectly captures the loose, improvisational rhythms of jazz. The CD enriches the experience with music and lively narration by James "D Train" Williams. The bright, bopping jazz score presents the creative energy of this most American of musical forms. The soundtrack also nods to the stars featured in the book. For instance jazz man number seven is bebop pioneer Dizzy Gillespie. Adult jazz aficionados will recognize riffs on his classic "A Night in Tunisia" in the background as Williams reads about him. R.G. Roth's collage illustrations are seamlessly integrated with the audio component. Each performer's signature sound is represented in bright, colorful letters that span their double page spreads. In this package, text, art and the sound work together to create meaning. Roth's bright palette also underscores the lively energy of the text and of the music it celebrates. An outstanding selection for classroom units or library programs about music or African American history and culture."